The R. D. Mathis Company “Baffled Box” Silicon Monoxide Source, SiO source, has proven to be an extremely successful method of depositing Silicon Monoxide. Source material is positioned in the boat within separate cavities, when heated it follows an indirect path through a series of baffles and then out of the exhaust chimney. The substrate cannot see the bulk material at any time. This essentially eliminates any chance of spitting and streaming which causes pinhole type defects. 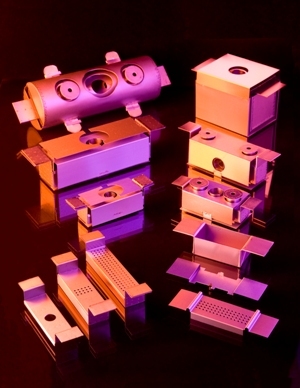 Many of the sources shown are available with up, down or horizontal exhaust ports. Custom fabrication and larger volume sources to fit your specific process needs are available upon request. A paper describing the techniques of Silicon Monoxide deposition and results using the “Baffled Box Source” is available upon request…ask for “Silicon Monoxide Evaporation with the Multi-baffled Box Source” by Earl Olson of the Halex Corp. and R. D. Mathis.